It was hot, hot, hot. The grounds at Stonelees Golf Centre where I’m lucky to be one of their recommended photographers looked amazing despite the fact that there has been no rain for weeks … and Kirstie and Chris looked pretty spectacular too! How those boys remained cool, calm and collected in their three piece suits, I don’t know … but they did and Kirstie and her bridesmaids looked stunning too. But there was a young man who stole the show. Tyler, who is just seven years old, proudly escorted his mum to be married and also gave a fabulous speech. Weddings are emotional and there were tears but much laughter too and I was delighted to be part of these wonderful celebrations. Here are a few images that sum up their day – I know that Kirstie is waiting to see them! Emerald green is a popular colour so far this year .. and Kirstie had accented Kelly and Kara’s dresses and bouquets with beautiful brooches. Tears, yes, but huge smiles also. And that boy can smile! 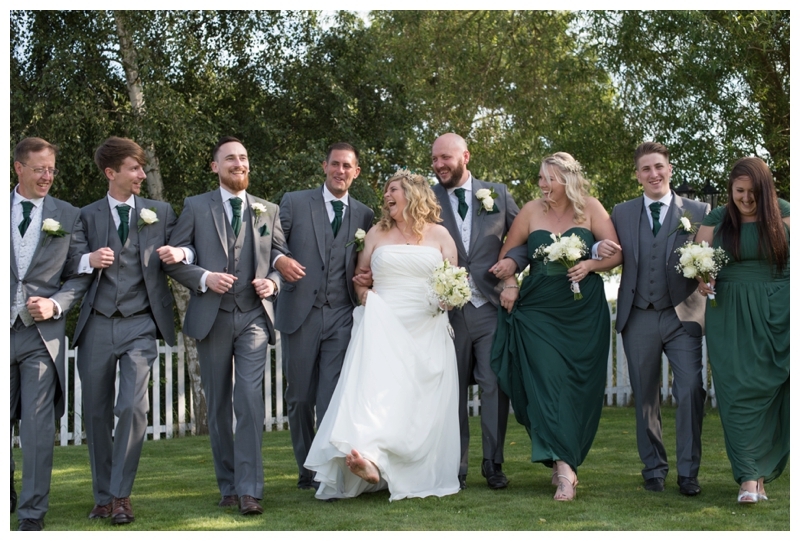 We did “formal” and then we did “relaxed” – Kirstie and Chris are young and so was their bridal party so it seem right to inject a bit of fun … After the meal and speeches, during room turnaround, the bride and groom get the chance to go out around the grounds in a buggy. Driving one of these can be a bit challenging (eh Chris?) and so I’m lucky to have Brian who drives me around … and thank you to the lovely Chelsea who co-ordinates everything at Stonelees. Kirstie and Chris’s wedding was a twilight wedding with a late ceremony but we still managed to get a lovely variety of images during the time that we had together. It was fabulous to be part of their day and I wish them all the very best of luck in the future as a family with the lovely Tyler and am looking forward to editing their images and sharing many more memories.